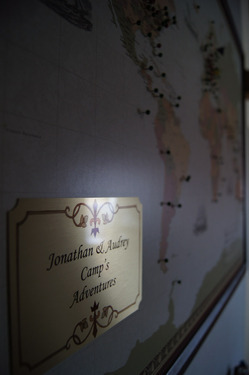 Jonathan and I travel because we want to see the whole world together, but we have our individual interests, too. He wants to climb every mountain. I want to see all the people. The farther I go, the more people I see and meet, the more convinced I am that everyone on earth shares a commonality of soul. Language and religion and skin pigment and eye shape are merely the reasons we use to bicker and go to war. But behind it all is a beating heart, a mind, the same basic survival needs. We want to live well, and we want to be allowed to define "living well" for ourselves. Travel is an education more than anything else. It is humbling to find yourself unable to communicate because you don't know the language. It is an exercise in resourcefulness to navigate the crooked, careening streets of foreign cities without a smart phone. New territory under your feet means a new perspective on the rest of the world, a vantage point from a corner you may not have considered before. The lessons you learn are not easily forgotten, especially if you find that seeing new places does something for your self esteem. Everything about travel requires patience. You'll have to find your way through the labyrinth of Geneva International Airport, forced to exit the rental car facility on the airport's France side and reenter the terminal on the Swiss side in order to access the correct airline. You'll have to drive Germany's infamous Autobahn while doing miles-to-kilometers per hour conversions in your head. You will get lost in Brussels and Paris, where streets change names every time they bend more than 15 degrees in any direction. Rue des Poissonnieres becomes Zwarte Lievevrouwstraat which becomes Rue de Laeken. You will accidentally order a dish full of mushrooms when you specifically tried to avoid them. You will get stared at, bumped in crowds, stymied by train station ticket machines. You will arrive breathless at the dock just as your boat pulls away, your flight takes to the sky, or your train whistles its way out of the station. And when you do make it home, because you always will, you will find that your patience has increased twentyfold and you're proud of the person in the mirror, the one with an independent sparkle in her eye. 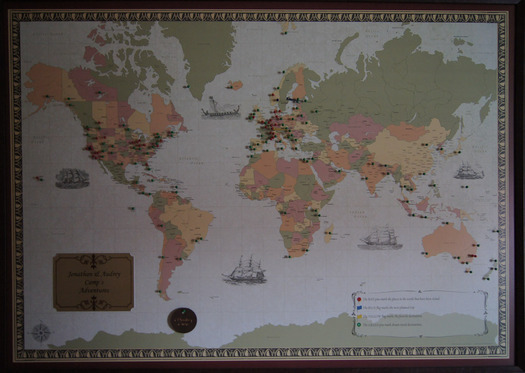 We keep a pin map on the wall in our home. Red pins are for all the places we've visited together. Green pins are for all the places we want to visit together in the future. Right now, even after five years of steady travel, the green pins far outnumber the red ones. But we're working on it. The fact that this is a lifelong proposition enhances our commitment to one another, too. Travel. It's the one piece of advice I give to people in relationships. All of those exercises in patience I mentioned earlier will teach you about yourself, but they will also teach you about the person you're with. If you're considering making a lifelong commitment to someone, go away together. See if he carries the heavy bags without being asked. See if she can roll with the punches when you haven't booked specific seats on the train and you end up crammed in the dining car with fifteen other people, all of them smoking like chimneys and sloshing their beer around the corners. If you can sit shoulder to shoulder with the person you love for eighteen hours in a confined space, a car or a plane cabin or a London hotel room the size of a Kleenex box, and you still want to look at him at the end of it, your relationship has all the potential in the world to succeed. And in the meantime, you'll be developing a relationship with the world. I walked up to a girl in Switzerland who had a long, tape tag still stuck to what was obviously a new shirt. MEDIUM! it declared to the world. I tapped her shoulder and tried to tell her. "You've got a tag stuck to ya!" She didn't speak English, but after I mimed it again for her, she realized what I meant, stripped the tag from the fabric, and crumpled it into a ball. She smiled and thanked me. We identified with one another. No language overlap required. So reach out! Ask your waiter how to pronounce a word you don't understand. Tell the girl in the café that you think her hat is pretty. Open doors. Pull out chairs. Hold the bus for someone running to the stop. Compliment the chef. Drop Euros in an outstretched paper cup. Interact. It's the best medicine in the world. We live in Norway now and we hope this will open up lots of exciting new travel possibilities for us. The green pins are just waiting to be replaced on the map. I look forward to the day when the plane of this flat, pastel representation of the globe is finally swept with red.